For one to four players, Rampage is a great dexterity game of monster destruction. 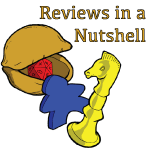 Each player takes on the role of a hungry giant monster who wants to destroy Meeple City, beat up other monsters, and chow down on as many meeples as possible to satisfy their grumbling stomaches. The game begins with players putting together Meeple City by constructing buildings out of meeples and cardboard floors. Once this a done, each player picks their monster and takes four teeth along with the corresponding paw disc, monster body, and player shield. For the last part of the setup, each player receives 3 cards: a character (special goal for bonus points), a power (something awesome that your monster can do), and a super secret power (an epic ONE use power.) Each player takes their paw disc and monster body and places them in one of the corners of the board. Then the rampaging begins! Move: Your monster can move by flicking your paw disc around the board. Your monster moves to where the disc lands. Demolish: If you are touching the sidewalk of a building you can try to smash it down! Take your monster’s body token and, with a straight arm, hold it above the board and drop it on the building. But be careful; if you don’t land on the building you lose a tooth! Toss a Vehicle: If there is a vehicle in your neighborhood, you can place it on top of your monster’s body token and then flick it off to try to wreak havoc on the board. Breath: You can use your monster’s breath attack to huff, puff, and try to blow over things in your path. Place your chin on top of your monster’s body token and then blow once to knock things down. Once you have completed your two actions, your monster gets to chow down on any meeples in the neighborhood, equal to the number of teeth that your monster has. Don’t forget to eat the floors! They are also worth points. If you knock down any of your opponent’s monsters, you eat one of their teeth. Any meeples that get knocked off the board are considered “runaways” who have escaped the wrath of the monsters. These runaways are placed on a special board that will eventually trigger an event. Everything that you eat goes behind your player shield and remains secret until the end of the game. The monster who eats the most wins! This game is really creative with its use of bits. The board is two sections; held together by a puzzle like piece. When you first get the game, some assembly is required. In order to get up and running for your first game, you need to apply stickers to some of the tokens and then apply the ruins to the board. Ruins are cardboard squares and rectangles with adhesive backing on them. The backing was a bit of a pain to remove and sometimes a little of the cardboard layer split. Be careful so that you do not ruin the ruins (pun intended.) You then stick the ruins permanently to the board. These ruins act as the foundations for your buildings and provide a bumper system to stop the paw discs from simply knocking them over. The buildings are constructed using meeples to hold up the cardboard floors. All of the bits are awesome. They are mostly made of wood. The artwork is fun and colorful with amusing details. There is even a Bat Signal beacon on top of one of the buildings. The rules are well written and organized with a lot of funny tongue-in-cheek references that made it enjoyable to read. The game also included well designed player aids. Rampage was silly fun! I enjoyed all the dexterity elements, as well as they powers which added a strategy to the game. It was fun to play; bystanders loved seeing things go boom, and when it was not your turn it was still interesting to watch what was going on. The game lasted about 45 minutes. It was the perfect amount of time for this type of game. Rampage will be the newest addition to our rotation because it is beautiful and will easily draw a crowd.